White paper on crime 2001 Part3/Chap.2/Sec.3/2. Classification activities conducted in juvenile classification homes include those related to family courts, those related to the Ministry of Justice, and general juvenile classification. Activities related to family courts include institutional classification, conducted for juveniles detained through adjudication for protective detention (commitment to a juvenile classification home)under Number 2, Clause 1, Article 17 of the Juvenile Law, as well as non-institutional classification, conducted at the request of family courts. Fig. 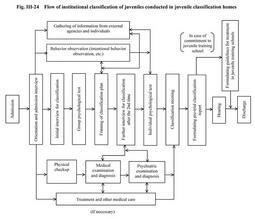 III-24 shows the flow of regular institutional classification of juveniles conducted in juvenile classification homes. The process of institutional classification comprises interview for classification, physical checkup, psychological test, psychiatric examination and diagnosis, behavior observation, and the gathering of information from related organizations and family members, etc. Information obtained from the result of such investigations is brought together in a classification meeting consisting of the director of the juvenile classification home, persons in charge of classification, and others. The aim of the meeting is to identify the characteristics and problems of the juvenile's predisposition, as well as factors leading to the involvement of the juvenile in delinquency and the risk of recurrence of delinquency. Then, the treatment plan, etc. , deemed most appropriate for the juvenile's improvement and rehabilitation is adopted as the opinion on classification. This opinion is summarized in the pre-trial classification report, to be presented to the family court prior to the hearing. The result of classification is recorded in a Juvenile Book along with other records, to be sent to the juvenile training school, probation office, etc. , in case of adjudication for protective measures. If adjudication is made to commit the juvenile to a juvenile training school, guidelines for treatment are formulated. The guidelines are sent with the juvenile to the training school to facilitate the formulation of an individual treatment plan. Non-institutional classification is conducted by summoning juveniles to family courts, juvenile classification homes, etc. Investigations for classification are mostly made through interviews and psychological tests, with a view to saving time. The result of classification is summarized in the pre-trial classification report to be submitted to family courts. Public prosecutors offices:mostly summary expert examination of juveniles at the stage of criminal investigation. Penal institution:classification on predisposition in order for the juveniles under 16 who were sentenced to imprisonment with labor or imprisonment without labor. Juvenile training schools:mostly re-classification of juveniles for whom changes in treatment plan need to be considered by reviewing relevant matters. Regional Parole Boards and probation offices:mostly classification of juveniles necessary for release on parole proceedings or the execution of probationary supervision. General juvenile classification is conducted in most cases at the request of citizens, public and private organizations, etc. , in order to contribute to decisions on policies for education, vocational guidance and other kinds of development and guidance of juveniles in the society at large. Through such activities, juvenile classification homes play the role of juvenile guidance centers in local communities, respond to the needs of the population in general, and contribute to the sound development of juveniles, the prevention of juvenile delinquency, etc. The number of persons received for classification in juvenile classification homes in the past 10 years is shown in Fig. III-25 . 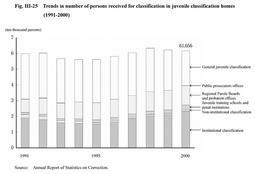 The number of juveniles received for classification in 2000 decreased by 517 (0.8%) from the previous year, to 61,656. By type of classification, institutional classification related to family courts had the largest share in the number received with 23,458 (38.0% of the total, up 10.9% from the previous year), followed by general juvenile classification with 22,106 (35.9%, down 13.6%). Of the classification activities related to the Ministry of Justice, classification requested by juvenile training schools and penal institutions has been increasing, accounting for 2,747 (33.0% up from the previous year). 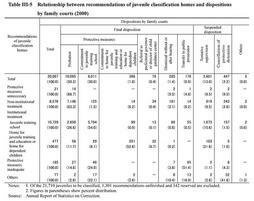 As for institutional classification related to family courts in 2000, Table III-5 shows the relationship between the recommendations of juvenile classification homes and dispositions by family courts concerning the juveniles for whom classification has been complete. Among the juveniles for whom non-institutional treatment was recommended, 83.3%were subjected to probation and 9.5% were placed under tentative supervision by family court probation officers with suspended disposition. As for juveniles for whom commitment to juvenile training schools was recommended, 54.0% were actually sent to juvenile training schools, but 26.6% were placed under probation and 15.6% under the aforementioned tentative supervision.